You couldn’t make this up. Britain’s potholed and noisy roads have such a bad world-wide reputation for damaging new cars that a Japanese manufacturer has replicated a British road to test them before they can be sold in the UK. Yes Honda has built four miles of rough British road -including British road signs and a roundabout -in Takasu, Hokkaido in Japan because they cannot find a main road bad enough to test car suspension in the 5500 miles between Japan and London. Evidently Britain is unique in building roads with porous surfaces which mean that every winter they crack, break up and create pot holes. Nobody else in Europe would dream of building such roads which are noisier and can’t cope with bad weather. As a spokesperson for Honda put more diplomatically: “The road surface in continental Europe, especially in the North, are paved with hard material which doesn’t absorb water. This is because in severe winter, absorbed water in the material may freeze turn into ice and destruct the roads. So now we know why we are having to put up every year with multi million pound bills, legal claims for compensation from councils. Instead we need to buy cars which have to be tested abroad on replicated British roads because they can’t find any like ours in their country. The full story is on the Exaro News at http://www.exaronews.com/articles/4921/japan-recreates-rough-uk-roads-in-test-track-for-new-cars . 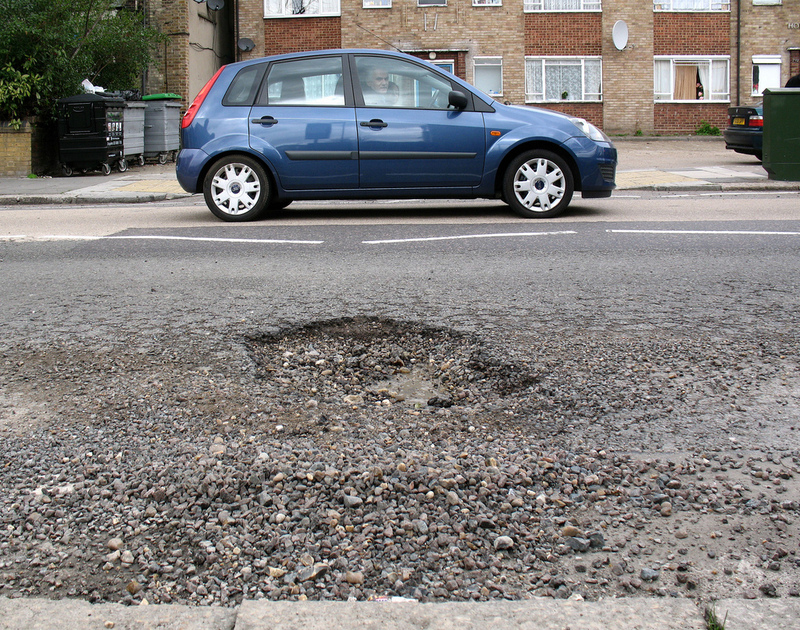 If you want to see the spiralling costs of pot holes see February’s Which/ magazine (http://bit.ly/11T0Lfn) . The outstanding bill for repairs is £12.93 billion. Or if you are really fed up why don’t you e-mail the roads minister, Norman Baker at norman.baker@dft.gsi.gov.uk and tell him to start bitmac ( the replacement for tarmac) roads with surfaces that are bound to crack up every winter. This entry was posted in environment, town hall, travel, Whitehall and tagged honda, norman baker, potholes, roads. Bookmark the permalink. Why doesn’t the UK admit its just a third world country, there’s nothing to be ashamed of now is there. That’s a very nice photo of a pothole: or is it two? Hard to tell. Please let’s have more of the same – perhaps some pics of a Japanese (note the correct term) pothole, for the sake of balance?